All parts of the award-winning series forged into one matchless collection. 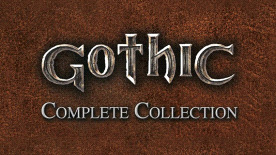 Enjoy the full experience of the Gothic series including all 3 parts & addons! Begin your journey as the nameless hero in a prison on the island of Khorinis in Gothic 1 and return to the mainland of Myrtana in Gothic 3. Witness the destruction of the magic barrier and the fall of the dragons, investigate the numerous mysteries of Khorinis and determine the struggle between humans and orcs. Your deeds will affect the fate of the whole empire – for better or for worse… Shape your destiny and Myrtana’s future! The full award-winning Gothic Series including all 3 parts & addons!